For more information on specific disorders please visit nami.org and click on "Learn More" then choose "Mental Health Conditions". The NAMI HelpLine is a free service that provides information, referrals and support to people living with a mental health condition, family members and caregivers, mental health providers and the public. A well-trained and knowledgeable team of volunteers, interns and HelpLine staff will respond to your call or message. Many staff members and volunteers live with a mental health condition or provide care and support to a family member or friend. The HelpLine also has volunteer attorneys and legal interns who provide legal expertise or a referral to an attorney in your community. Violent tragedies leave traumatic impressions not only in the communities in which they occur (including first responders), but also our national community. The immediate impact may affect existing mental health conditions or contribute to ones in the future. Public policy makes a difference in the lives of both the people living with mental health conditions and the people in their lives. Changes in policy can mean better outcomes. Our advocacy efforts have led to many victories. But we still have work to do, and we need your help. Learn about mental health advocacy. Talk to your neighbors, friends and family about why these issues are important. Find out how you can get involved with your local NAMI's advocacy efforts. Policy change is one major way we can make a difference in the lives of people living with mental health conditions and their families. NAMI’s legislative and public policy priority is to support Americans affected by mental illness’ opportunities to build better lives. NAMI advocates for an array of issues. Millions of American’s lives are impacted daily by mental health conditions. As a way to show support for these people NAMI participates in several annual mental health awareness events. Each year, 2 million jail bookings involve a person with mental illness. Approximately 15% of men and 30% of women in local jails have a serious mental illness. 1 in 4 people killed in officer-involved shootings has a serious mental illness. Since 1988, NAMI and our national network of local and state organizations have partnered with law enforcement agencies on Crisis Intervention Team (CIT) programs, which help law enforcement cope with these difficult calls for service and increase safety in these situations—for officers, individuals in crisis and bystanders. Each year we fight stigma, provide support, educate the public and advocate for equal care. Each year, the movement grows stronger. Raising awareness on your own, as part of a small group or part of your community can make a difference. Sharing your story about your personal experience with mental health challenges is a great way to encourage others to talk about what they’re experiencing. When more people share stories of recovery, struggle or hope, it lets all of us know that we're not alone.Add your voice by sharing creative content such as stories, messages, poetry, inspirational quotes, photos, videos and song lyrics in a safe, moderated space. You can even upload your photo in You Are Not Alone. OK2Talk is geared toward teens and younger adults and is a great way to share your feelings. Understanding mental health isn't only about being able to identify symptoms and having a name for these conditions. There is a complicated system involving local communities, the federal government, research institutions, private companies and other pieces that are all trying to fit together. Each piece contributes to our understanding of mental health—if one is missing, the picture isn't complete. Research is vital to advancing our understanding of mental health and—one day—finding a cure for mental health conditions. Research is the ultimate source of hope for people in recovery and their families. It's time we talk about mental health. Share what's on your mind. Share your feelings. You are not alone. Want to follow NAMI.org on Tumblr? Simply sign up. It's that easy! Browse our video archive of inspirational stories, PSAs, educational shorts and more. and clicking on the red Crisis Info button on the home page. The Program of Assertive Community Treatment (PACT) is an effective, evidence-base, outreach-oriented, service delivery model for people with severe and persistent mental illnesses. Using a 24-hours-a-day, seven-days-a- week, team approach, PACT delivers comprehensive community treatment, rehabilitation and support services to consumers in their homes, at work, and at community settings. It is not availabe in every area. For detailed information to help decide if the PACT model is available for you and right for your famiy, visit namimass.org and type "PACT" in the search box. The individual with the mental illness has to be eligible and apply for the PACT program through the Department of Mental Health. There is a limited number of slots available and there may be a waiting list. 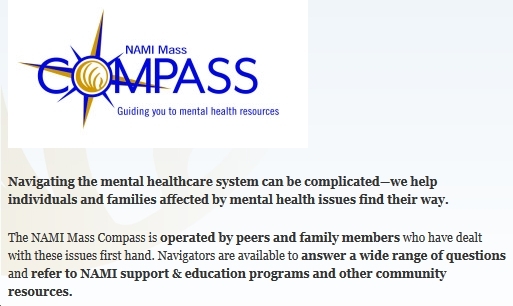 NAMI-Mass Compass Helpline: 617-704-NAMI (6264) or 800-370-9085, M - F 9 a.m. - 5 p.m.
Click here: Know your discharge rights from a psychiatric facility in Massachusetts. Free, anonymous online mental health screening from NAMI Massachusetts. Click here to see statewide ESP providers list. CHD also offers primary care services for its clients in partnership with Caring Health Center and Holyoke Health Center at CHD’s State Street and Appleton Street Outpatient Behavioral Health Clinics. Services include regular care with a primary care provider as well as access to enhanced wellness programming. Click here for details. Clinical & Support Options Inc.
Baystate Health Sciences Library is a resource library for the National Network of Libraries of Medicine. They serve the needs of Western Massachusetts , provide materials ,and assist with searching for health information. All information provided should be considered for informational purposes only, not construed as medical advice or opinion. You can e-mail inquires to library@baystatehealth.org, or call (413) 794-1862. The Boston Public Library maintains complete information services on higher education and preparation for the General Education Developement (GED) test for high school equivvalency diploma. Call 1-617-536-5400 or visit: bpl.org. Community Mental Health Centers provide emergency assessment and services, community placement, medical supervision, treatment and case managementin the community for people with mental illness. For information regarding psychiatric medications visit (CPNC) College Psychiatric and Neurologic Pharmacists and click on resources. The Dana Alliance for Brain Initiatives is a nonprofit organization committed to advancing public awareness about the progress and promise of brain research and to disseminating information on the brain in an understandable and accessible fashion. Individuals with a mental illness can obtain a "request for services" forms - one for children and adolescents and another for adults-by visiting the DMH (Massachusetts) website and clicking on the Key Resources/Service Application Forms link. ECT Treatment: "A Light in the Darkness"
a non-profit group educating people about the effectiveness of Electro-Convulsive Therapy (or ECT) in helping individuals with depression. We include patients helped by ECT, family members and friends who have seen the benefits of ECT, and doctors who recognize the effectiveness of ECT. The Health and Human Services Office for Civil Rights provides a variety of resources to help peole understand HIPAA laws (Health Insurance insurance and Accountability Act of 1996. Help Yourself/Help Others: Individuals can find a local mental health screening site or take an online screening by clicking here. Lives in the Balance is the non-profit organization founded by child psychologist Dr. Ross Greene, originator of the empirically supported Collaborative & Proactive Solutions (CPS) approach and New York Times bestselling author of the influential books The Explosive Child, Lost at School, Lost and Found, and Raising Human Beings. THE MASSACHUSETTS CLUBHOUSE COALITION (MCC) IS A NON-PROFIT ORGANIZATION COMMITTED TO HELPING PEOPLE WITH LONG TERM MENTAL ILLNESS FIND AND SECURE EMPLOYMENT, HOUSING, EDUCATION, SERVICES AND SUPPORT IN THE COMMUNITY. MCC MEMBERSHIP INCLUDES OVER 15,000 MASSACHUSETTS RESIDENTS WHO HAVE MENTAL ILLNESS AND THE 20+ QUALITY ACCREDITED RECOVERY AND REHABILITATION CENTERS CALLED "CLUBHOUSES" THAT HELP TO SUSTAIN THEM. The Mental Health Legal Advisors Commitee has prepared a Mental Health Law Guide, a collection of pamphlets that discuss the rights of people with respect to hospitalization, their rights while an inpatient in a mental health facility, their rights with respect to medication and other matters. Call 1-800-342-9092 or visit mhlac.org. What is a Warmline? 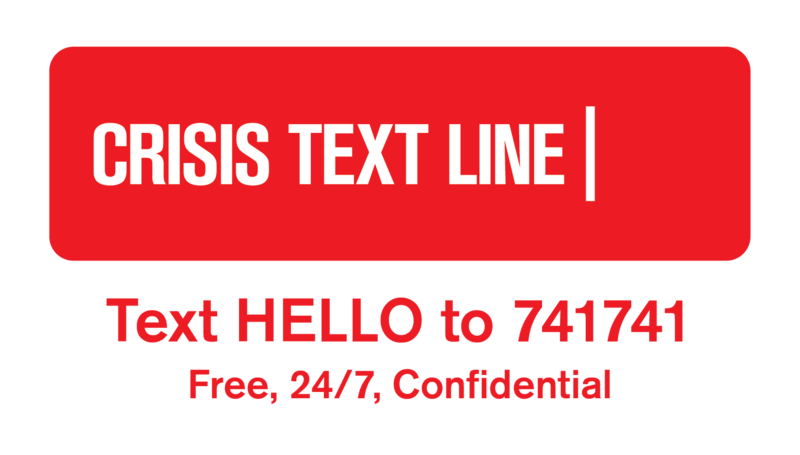 As opposed to a crisis line where a clinician answers the phone and focuses on helping the caller determine whether or not they need additional services like respite or the hospital, a warm line is answered by an individual with lived experience who is available for support, resources information or just to talk. These line are usually available after hours and on the weekends. Monday - Friday: 5p.m. - 10p.m. ; Saturday and Sunday: 4p.m. - 9p.m. Wednesday through Sunday from 6p.m. to midnight. (Operated through the Behavioral Health Network in Springfield, MA. Accepts collect calls). Worried about the way your child is acting or feeling? The Children's Behavioral Health Initiative (CBHI) is an interagency initiative of the Commonwealth's Executive Office of Health and Human Services whose mission is to strengthen, expand and integrate Massachusetts state services into a comprehensive, community-based system of care, to ensure that families and their children with significant behavioral, emotional and mental health needs obtain the services necessary for success in home, school and community. is a statewide network of knowledge sharing through dissemenation, engagement, and collaboration among academics, community providers, mental health service users and family members. (MHE & YOU) Mental Health Experienced & Years of Understanding - Is the SPARC consumer advisory council. SPARC members advise and make recommendations on research, training and technical assistance activities conducted by the SPARC and are actively engaged in disseminating research findings. In collaboration with DMH and its academic and community partners, the Systems and Psychosocial Advances Research Center (SPARC) provides state-of-the-art and recovery-informed research, training, and systemic interventions to enhance the mental and behavioral health of all citizens in Massachusetts and beyond, and to guide leaders in the development of enlightened public health policies that support the treatment and prevention of mental illness and addiction across the life span. Hearing Voices of Support is an initiative to promote acceptance, support, hope, and recovery for people living with schizophrenia and related brain disorders. See and hear how hearing voices of support have helped these people affected with schizophrenia and related brain disorders. Share your voice of support through uploading videos, leaving posts and sharing content to build the bridge that connects those affected with schizophrenia related brain disorders to the wider community. A true labor of love: Enlightening, Informative, and Hopeful Heartfelt stories shared by individuals who have courageously shared their insights, challenges, and dreams. TARA offers a guide for choosing a dialectical behavioral therapy (DBT) provider for individuals living with personality disorders. TARA's hotline nmuber is 1-888-482-7272. (WMLS) provides free legal help in non-criminal cases for low-income people and elders who live in western Massachusetts. The assistance provided ranges from legal advice to full representation. If you're looking for a complete list of civil (non-criminal) legal aid programs in Massachusetts, please visit masslegalhelp.org. For links to civil legal aid in other states, try lawhelp.org. For additional resources please call 413-786-9139 (Toll Free: 800-295-2121) today.